This classic slow-simmered caldereta uses excellent ingredients starting with red wine and finishing with brandy and sherry. The thickening agent is also authentic as it uses bread crumbs which stems from a medieval practice. Goat meat, unlike beef, pork or chicken needs some extra step in preparation because if not done so, the dish will taste gamy. The common preparation is marinating it in vinegar or boiling it with water, vinegar and black peppercorns. But this goat stew uses red wine to remove the gamy taste by marinating it for hours. 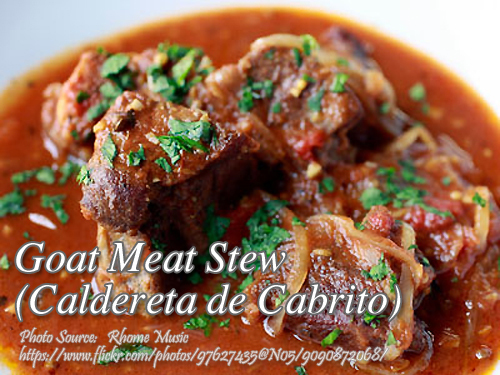 To cook the goat meat stew; Marinate the goat meat in red wine for half a day. Boil the meat in water until almost tender. Reserve the stock. In olive oil, saute in garlic and onion. Brown the meat. Add the tomato paste, olive brine and tomato. Simmer until meat is tender. Season with paprika. If the sauce reduces, add goat stock and wine. Thicken sauce with cheese and bread crumbs. Add olives and peppers. Season with salt and pepper. Add brandy and sherry and continue to simmer until cooked. Marinate the goat meat in red wine for half a day. Boil the meat in water until almost tender. Reserve the stock. In olive oil, saute in garlic and onion. Brown the meat. Add the tomato paste, olive brine and tomato. Simmer until meat is tender. Season with paprika. If the sauce reduces, add goat stock and wine. Thicken sauce with cheese and bread crumbs. Add olives and peppers. Season with salt and pepper. Add brandy and sherry and continue to simmer until cooked. Hi KEURINMEOW, I’ve updated the recipe so now it has, number of servings, preparation and cooking time. I have just been given some goat meat and this looks like The perfect way to use it. What do you recommend serving it with? Hi Mark, you can serve it with rice or bread.